Property 6: "SoHo Penthouse" South Brisbane. Spacious Southbank 2 Bed Apt With Free Parking and WiFi! Property 24: Spacious Southbank 2 Bed Apt With Free Parking and WiFi! "TREWERN APARTMENT" IN "SAN LUCA" CASTLE. Property 26: "TREWERN APARTMENT" IN "SAN LUCA" CASTLE. Best Value Luxury Stay at South Bank, Brisbane! 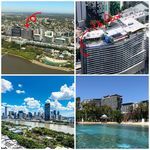 Property 34: Best Value Luxury Stay at South Bank, Brisbane! Property 39: 4 Star Hotel Apartment with City and River Views! Free Parking Available! Luxury studio apartment close to city including starter breakfast pack. Property 42: Luxury studio apartment close to city including starter breakfast pack. In the heart of South Bank so easy to walk to everywhere, fantastic gym, and amazing views from the roof top pool. A second set of keys would have been useful.